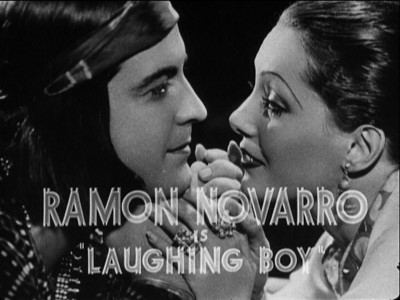 In Laughing Boy, Latino heartthrob Ramon Novarro dons an awkward looking wig to play the title role, a simple, earnest Navajo. Among a batch of Novarro's MGM vehicles getting rereleased on made-on-demand DVD from Warner Archive, this 1934 film probably isn't the best place to start for those interested in the once-huge, now unjustly obscure actor. Novarro tries, but the clunky melodrama it offers isn't a good match for his modest talents. If anything, Laughing Boy dripped with prestige - it was based on a lauded novel by Oliver La Farge, winner of a Pulitzer in 1930 yet rarely read today. The Harvard-educated La Farge delved into the customs of the Navajo tribe to tell this story. Set in contemporary times, the book follows the life of an athletic hunter and skilled craftsman - nicknamed Laughing Boy for his child-like nature - who falls in love with a disgraced native woman already in a sexual arrangement with a white man. MGM's subsequent film version doesn't skimp too badly on the novel's racy aspects, and it should have been a sure thing with direction by W. S. Van Dyke (Tarzan, the Ape Man; The Thin Man). Instead, it wound up being a miscast, strangely unmoving dud. 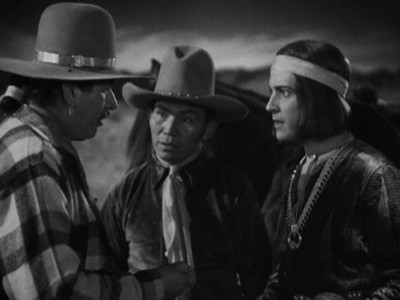 While the casting of Latino actors Novarro and Lupe Velez as Native Americans hurts Laughing Boy's credibility, the most damaging thing they did here is to present the title character as a complete simpleton. Wait - Laughing Boy isn't just simple, he's dumb. Novarro's character is set up as a noble paragon of virtue, being relatively untouched with the corrupting ways of the whites - unlike the object of his love, Slim Girl (Velez, oddly affecting in a rare non-comedy). Novarro lends the character a sweet, endearing charisma, but he doesn't bring much depth. The romance between the two plays out interestingly enough, with Slim Girl wanting to marry Laughing Boy yet unable to fulfill the traditional duties of a Navajo wife. Since Slim Girl was raised by whites and enjoys going to town donned in modern dress, the couple's eventual union doesn't go too well. Laughing Boy remains the passive dupe throughout, although his hunting abilities come in handy when he finds out that his bride has been carrying on with Hartshorne (William Davidson), a surly white rancher with an abusive streak. Much of Laughing Boy was filmed on the reservations in Northern Arizona, with actual Navajos playing the parts of Laughing Boy's family members, friends and adversaries. 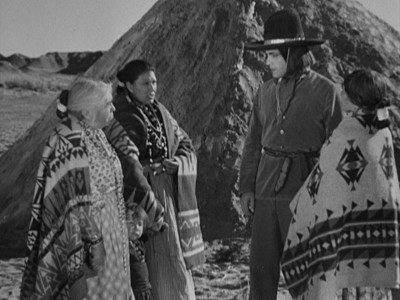 Despite the natives' lack of acting skills (they recited their lines phonetically, according to a recent Novarro biography), the settings and supporting cast lend the story a much-needed authenticity. Keep in mind, however, that this is the kind of film where Novarro is seen riding a horse on a real landscape which awkwardly transitions into Laughing Boy and steed on a phony MGM backlot with rear-screen projection. Adding in Novarro's obvious makeup job and the fact that the script inexpicably calls on Laughing Boy to sing (halting the story's momentum), and you get one crazy mishmash of a movie. This well-intentioned effort flopped in 1934, and time hasn't been too kind to it. The 1.37:1 aspect ratio image on Warner Archives' edition of Laughing Boy looks a bit weathered, but it's a stable, pleasant image with good light-dark balance. The photography tended to go out of focus a few times, yet it's a nice appearing disc compared with other films of this vintage. The disc is furnished with the film's mono soundtrack in an adequate mix which has the expected pops, clicks and hiss, yet generally sounds fine. No subtitle track is included. 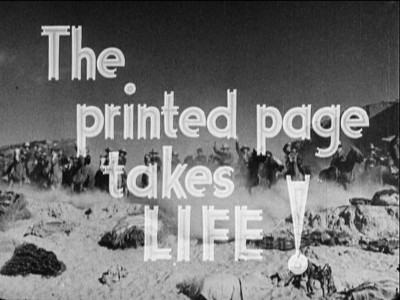 The sole extra is the film's original Theatrical Trailer, which sells it based on W.S. Van Dyke's impressive track record on lusty adventures in exotic locales (Tarzan, the Ape Man, White Shadows in the South Seas and Trader Horn are mentioned; Eskimo is not). MGM's 1934 production Laughing Boy improbably cast fading heartthrob Ramon Novarro and "Mexican Spitfire" Lupe Velez as Navajo indians who find solace (and love) in being fellow outcasts from society. Latino history students might want to check this one out, since it clumsily points out all the ways Hollywood mishandled its few big Mexican-American talents. Rent It.